Inverness Terrace Bayswater Apartments in London is an apartment building. 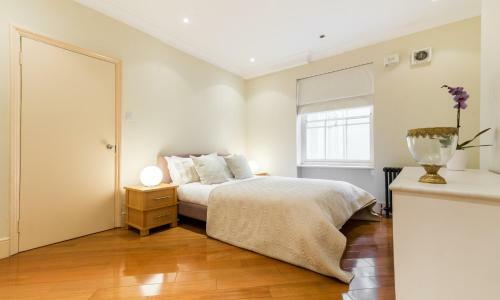 Inverness Terrace Bayswater Apartments in London features accommodation with free WiFi, 1.9 km from Portobello Road Market. Guests have a private patio. This 2-bedroom apartment includes 1 bathroom equipped with a bath, a shower and a hair dryer. The accommodation is fitted with a kitchen with a dishwasher and an oven. The Serpentine is 2 km from the apartment, while Hyde Park is 2.3 km from the property. The nearest airport is London City, 19 km from Inverness Terrace Bayswater Apartme, and the... property offers a paid airport shuttle service. Inverness Terrace Bayswater Apartments in London features accommodation with free WiFi, 1.9 km from Portobello Road Market. Guests have a private pati...o. This 2-bedroom apartment includes 1 bathroom equipped with a bath, a shower and a hair dryer. The accommodation is fitted with a kitchen with a dishwasher and an oven. The Serpentine is 2 km from the apartment, while Hyde Park is 2.3 km from the property. The nearest airport is London City, 19 km from Inverness Terrace Bayswater Apartme, and the property offers a paid airport shuttle service. When would you like to stay at Inverness Terrace Bayswater Apartments?